Canada-based Macro Engineering & Technology Inc. has developed a new high speed co-extrusion line for producing biaxially-oriented (BO) sausage casings. The line includes a primary bubble forming section with a vacuum calibrator, orientation section with infrared (IR) sectional heaters and an IR annealing oven. The bubble diameters in each section are precisely measured and controlled to ensure consistent production quality, says the company. Macro has incorporated an advanced control system to assist operators. The control system contains recipes for automatic ramping up and down of the line speed with simultaneous adjustment up to 30 process parameters. The line can be configured to produce co-extrusion casing structures up to 11 layers using polyamide (PA), polyethylene (PE) and ethylene vinyl alcohol (EVOH). It can also be extended to allow processing of structures with polyvinylidene chloride (PVdC). It produces casings with width calibers of 80-120mm and thickness ranging from 40-50 microns. The line operates at speeds up to 170m/min. 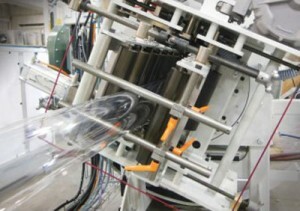 In addition, Macro says the line can be readily converted to produce films for barrier shrink bag production.